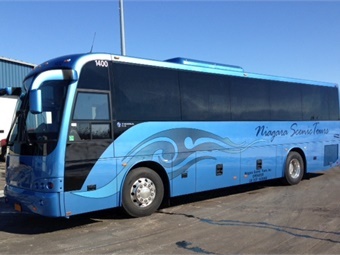 Hamburg, N.Y.’s Niagara Scenic Tours added their second Temsa TS 35 from CH Bus Sales. Niagara started with their first TS 35 in early 2014. The majority of Niagara’s groups consist of college athletics, scheduled tours, casinos and school groups, and the 40 passenger TS 35 is perfect for the sports teams. The operation’s coaches are equipped with 110-volt plugs, USB ports, Alcoa wheels, a preheater, REI monitors and upright mirrors. The Temsa TS 35 coach is a fully integral mid-sized coach that offers a luxurious and spacious interior for passengers and driver. This coach is also equipped with an American drivetrain, Cummins ISL 345 HP-EPA 13 engine and Allison B500 transmission. CH Bus Sales LLC. is the exclusive distributor of Temsa motorcoaches in the U.S.